NEW YORK (CNN) -- In a new bankruptcy court filing, some investors swindled by convicted Ponzi schemer Bernard Madoff seek to reframe calculations that will determine how much money they can collect from a pool of recovered funds. 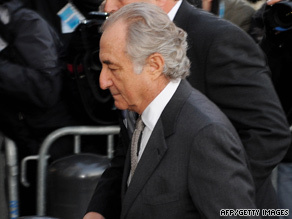 Bernard Madoff walks to federal court in New York in March. They want their share of recovered money to be based on not only the money they deposited in Madoff's fund, but also the total of the dividends reflected in their account statements. Madoff trustee Irving Picard has taken the position that each investor's "net equity" includes only the amount of the deposits made into their account minus later withdrawals -- and that the grossly inflated figures promised on customers' account statements are of no relevance. In the claim, filed in the Southern District of New York late Friday, the plaintiffs "seek a declaratory judgement as to the proper method of calculating the amount of their claims against Madoff." The filing contends that Madoff's investors are entitled to the total market value of the securities as depicted by the financial statements sent out by Madoff Investment Securities. The claim details heart-wrenching accounts of investors in their late 50s, 60s, 70s and 80s who, with the collapse of Madoff's Ponzi scheme, found themselves unable to make payments on medical treatments, mortgage payments, children's or grandchildren's college tuition, and retirement expenses. Attorneys for the victims have argued the trustee's approach "disregards the customer's monthly statements entirely, and improperly deprives the customer of all appreciation in his portfolio." Madoff, 70, pleaded guilty in March to 11 federal counts including fraud, money laundering and perjury. Authorities said he ran a $50 billion ponzi scheme.